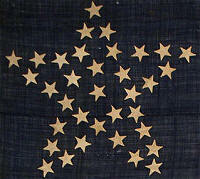 This beautiful flag of 35 stars, in what is known as the "Great Star" or "Grand Luminary" pattern, is an important and majestic example of the type. The flag falls squarely into the period of the Civil War, with the introduction of West Virginia as the 35th state after voting to secede from Confederate Virginia. Sewn at the height of the Great Star form, the star is well proportioned and symmetrical. Often, great star patterns are oriented such that the star stands straight vertically when the flag is hung vertically, resulting in a canted star when displayed horizontally. When this flag is displayed horizontally, its Great Star stands straight and proud on its deep blue canton. When considering a flag such as this, it's important to remember the circumstances of the nation at the time when it was produced. 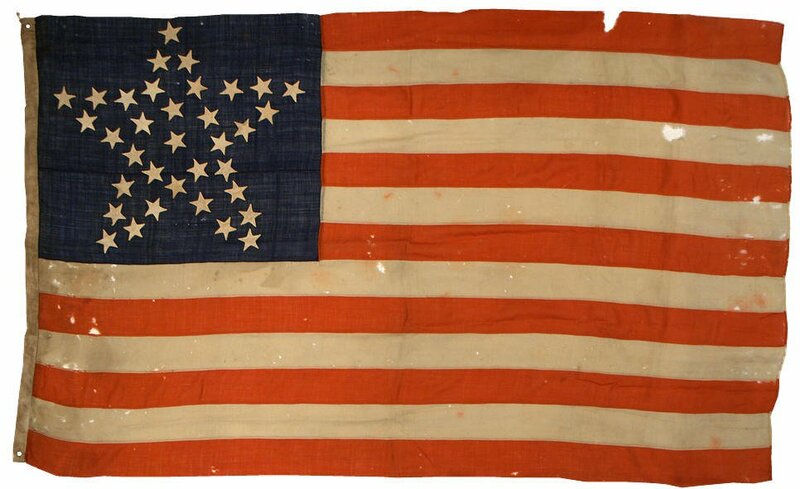 The flag was produced at the absolute height of the Civil War, with the Union torn asunder and hundreds of thousands of soldiers on both sides of the conflict dying in horrific and escalating battles. President Lincoln urged the north to keep the national flag intact, and to not remove stars for the seceded states. Therefore the 35 stars in this flag, arranged at the height of conflict into one united great star representing all of the American states, is extraordinarily symbolic and profound. The stars of the flag are hand sewn cotton and are double-appliqué, meaning that they are sewn back-to-back on both sides of the flag. The grommets of the flag are whip-stitched, which is expected for the period. Overall, the flag is in an extraordinary state of preservation, being nearly intact, with only minor mothing and very little loss for a flag nearly 150 years old. Period Great Star flags such as this are the height of desirability in flag collecting and this rare example is a treasured survivor, representing the principles of Union in a time of great strife.